When you're running to catch a cab to dinner and suddenly you realize your outfit is coordinating with an architectural beauty of a building you stop and have an impromptu photoshoot. No? Just me? Can't be just me! The weather in the city has been gorgeous this past week; the sunny skies and warmer temperatures have me switching out boots for pumps and I couldn't be more excited. It's even light out past 7:30pm! 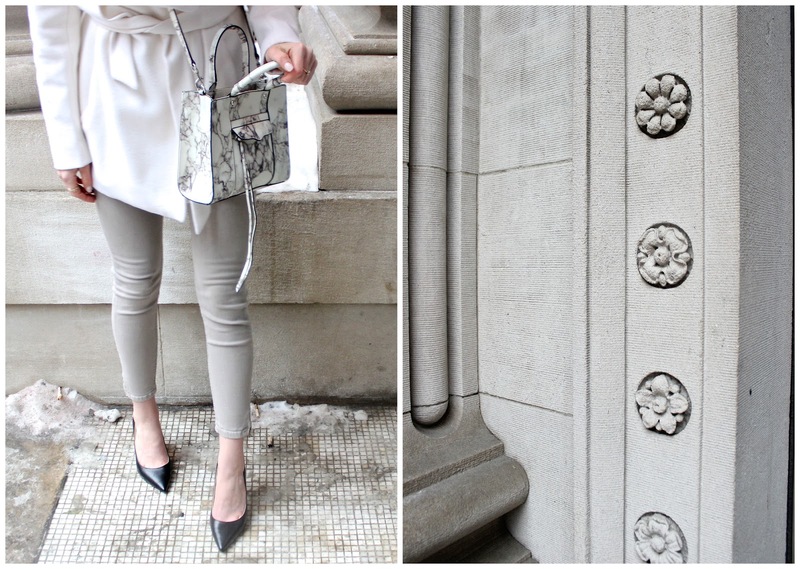 I know we're heading into the "melty snow phase", but the crisp spring air is on it's way and there is nothing more crisp than a monochromatic white and beige outfit, with a hint of marble of course! Love this outfit! So chic and sophisticated but still warm and cozy and I love your bag, such a statement. You look amazing! You're so sweet, Courtney! I am trying to spring ahead while still preparing myself for the chill! This outfit is perfect, and I love the location - I would totally want the photoshoot as well! Thanks doll! It was too good a location to pass up! Love the coat! It is amazing!!! Beautiful!! I love this combination! And that bag is absolutely amazing!